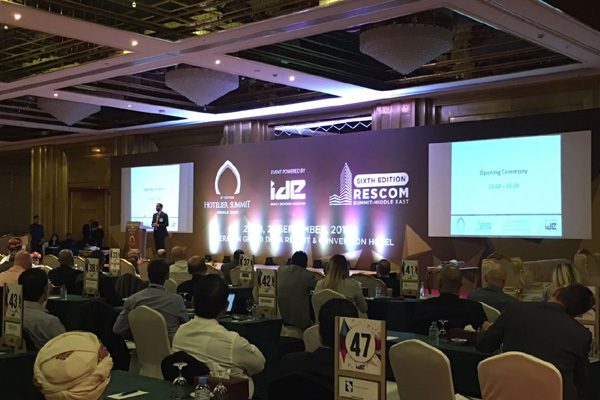 The eighth global edition of Hotelier Summit, which enters the Middle East for the first time, has kicked off today (September 27) in The Sheraton Grand Doha Resort and Convention Hotel in Doha, Qatar. Organizers of the event said that creativity in hospitality design and new guest experiences are taking big chunk of the discussions on the first day. Hotelier Summit-Middle East is held against the backdrop of a recent research done by Alpen Capital, which predicts the Gulf hospitality sector is expected to grow by $11.1 billion in five years, from $25.6 billion in 2015 to $36.7 billion in 2020. The summit, a part of the Hospitality Series conducted by IDE, has Qatar Airways as its Official Airline Partner and Colliers International as the knowledge Partner. Other supporters include AIA Middle East as Associate Partner, Qatar Green Building Council (QGBC) as Sustainability Partner and Forbes Middle East as Business Magazine Leadership Partner. “Qatar and the UAE will register a growth of 10 per cent until 2020 due to Expo 2020 and 2022 FIFA World Cup respectively. Saudi Arabia, Kuwait and Oman are expected to record an average growth of 5-6 per cent, according to the report. The growth of the hospitality market in the Gulf is being discussed in details by global and regional experts at the 8th global edition of Hotelier Summit,” said Ganesh Babu, director - India & Middle East, IDE, organiser of the summit. The summit guarantees an exciting business experience to all participants, as has attracted over 180 industry experts comprising leading hotel owners, operators, developers, architects, interior designers, consultants and service providers, making it a one-stop B2B platform for the Middle East hospitality industry. The event consists of various seminars, focusing on the potentials and challenges in the hospitality sector in this region. Each section is being led by prominent industry figures hailing from different parts of the world. For the first time through this summit, Lufthansa is venturing into the Hospitality Sector of the Middle East as Gold Partner providing Hospitality Solutions and Room Controls. Other supplying partners include Credo Trading & LBDI as the official Construction Partners, Precor from the UK as the official Fitness Equipment Partner, Asfour Crystals from Egypt as Official Lighting Partner and Diamond Life from China as Gold Partner. “The summit is tackling the political instability in some markets in the Middle East and the falling demand vis-a-vis room supply which are two key factors putting pressure on occupancy and average daily rates,” he added. “Challenges facing the regional hospitality industry are taking up a major chunk of our discussions during the summit, with the topics varying from the risk of an unbalanced supply demand market to the potential shortage of right human resources to manage the newly opened hotels and furnished apartments,” Babu added. Some of the 80 Project Holders present at this initiative include Decision Makers from Fairmont Hotels, WATG, Al Faisal Holding, Times Hotel, Khatib & Alami, Carlson Rezidor and Riyada Hotels & Resorts.